The NEW Synergy TJ / LJ Adjustable Rear Track Bar is bent to clear most aftermarket differential covers. Includes new Grade 8 mounting bolts and hardware and is made from high quality 1-1/4" 1018 CR Solid Round Barstock. Allows centering of rear axle when running a suspension lift. These feature an abrasive resistant powder coat finish for maximum durability and corrosion resistance. 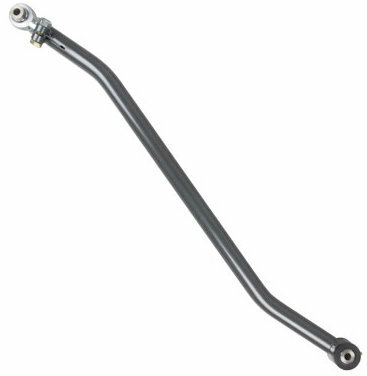 Heavy duty heat treated chromoly rod end at axle end with a Synergy double adjuster sleeve & pinch bolt assembly which allows for adjustment of track bar length without removing mounting bolt. 100% bolt on components assures an easy, trouble free installation with the use of basic hand tools.